Oh! A Little Quilts "Stitch 'n Sew" session was cancelled for this Friday evening (bring a project to work on for a nice long evening/visit/pizza) because Yours Truly was the only one to sign up. Would anybody else in Little Quilts vicinity be interested in doing this? Call today and sign up! Although this has made me decide to try to jump back into the Jo Morton class, which I had decided I should skip this time since I signed up for three other classes/activities. Usually you do this thing with a square block. She has an example or two of rectangular blocks in her book, with the caption "it is trickier to do the figuring for a rectangular block..." but no instructions. This is the second set of strips I put on for the block set, having destroyed the first set with experimental cutting, but after a little session with pencil and graph paper, I got it figured out. Looks like summertime to me...I love the srappy charm quilt. Wow - those oranges looks great. I don't think I have much orange in my stash, but maybe I should rethink that. The little orange quilt is great. 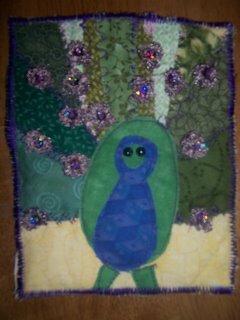 Thanks for sharing the charm quilt picture also. Congratulations on your great weight loss. What an inspiration you are! Oh, I'd sign up in a minute if I lived nearby. But then it's probably a good thing for my "no buy" pledge that I DON'T live nearby! I'm hoping for enough bad weather that everything (like work) will be cancelled tomorrow. They say we should get sleet, right??? How about you, wouldn't you prefer to stay home in jammies and sew? I ove the orange quilt. I have to admit orange is my favorite color so my eye goes there immediately. Sorry to hear you class has been canceled, I am sure there is a good reason. Enjoy just sewing at home. oohh I see your girlie again. i have to pick up that project.. I want to make something small , tho my daughter like it so much she want to have a whole quilt with girlies :-)) I wish I don't need sleep ! l love the orange quilt! Your little orange quilt is lovely! All of these quilts are gorgeous. I especially like the orange stars. I am going to have to buy some orange fabric.